Nya Jerami fled Thesolo for the glitz and glamour of NYC but discovered that her Prince Charming only exists in her virtual dating games. 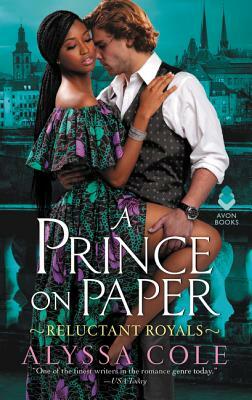 When Nya returns home for a royal wedding, she accidentally finds herself up close and personal—in bed—with the real-life celebrity prince who she loves to hate. For Johan von Braustein, the red-headed step-prince of Liechtienbourg, acting as paparazzi bait is a ruse that protects his brother—the heir to the throne—and his own heart. When a royal referendum threatens his brother’s future, a fake engagement is the perfect way to keep the cameras on him. Nya and Johan both have good reasons to avoid love, but as desires are laid bare behind palace doors, they must decide if their fake romance will lead to a happily-ever-after. Alyssa Cole is an award-winning author of historical, contemporary, and sci-fi romance. Her books have received critical acclaim from The New York Times, Library Journal, BuzzFeed, Kirkus, Booklist, Jezebel, Vulture, Book Riot, Entertainment Weekly, and various other outlets. When she’s not working, she can usually be found watching anime with her husband or wrangling their menagerie of animals.